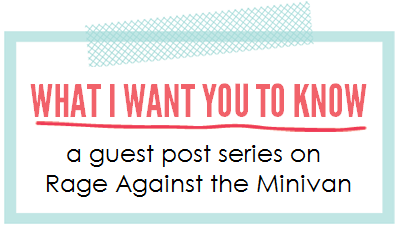 What I Want You to Know is a series of reader submissions. It is an attempt to allow people to tell their personal stories, in the hopes of bringing greater compassion to the unique issues each of us face. If you would like to submit a story to this series, click here. Today’s guest post is by Amy Townsend. My name is Amy and I am a working mom. I have three kids aged 3, 2, and 7 weeks. I desperately love my kids and my husband. I love Jesus and am working daily on loving Him more. I want you to know that there are a lot of reasons for moms to work. Some work because they need to and some work because they want to. A lot of us are somewhere in between. I work because we like the lifestyle we live and can provide for our children. I work so that my husband can follow his dreams and take a job that pays a lot less but that he likes a lot more. To be really honest, I work because I think I can be a better mom if I miss my kids a little bit. And I do miss them. I want you to know that working moms feel a lot of guilt. This guilt is both self inflicted and inflicted by others. Especially in the “Christian” community. I read a blog recently that spoke of the judgment that is placed on working moms by stay at home moms. I feel this judgment. I am the only one in my group of friends that works full time. I get it. I want you to know that stay at home moms don’t have the market cornered on being good moms. I want you to know that I do my best to arrange my work schedule to spend as much time with my kids as possible. I went back to school to obtain my Master’s degree so I can have a more flexible job in my field. When I’m at work I think of what I can do to leave early to be with my kids. I often bring work home to do after they are in bed. I want you to know that it’s okay to feel guilty for leaving your kids with a nanny. But it’s okay to bring other people into those little babies world. It might even make them better people to be exposed to different people. I want you to know that I have cried hours over leaving my babies with those different, amazing people. But what I know is that they will be okay. I want you to know that I couldn’t do this without an amazing husband. I know there are a lot of women who can do this alone, and do, but I’m not one of them. My house is often messy. There is always laundry to be done. But between the two of us and a great nanny, it all eventually gets done and that is okay. I want you to know that my kids have no shortage of hugs and kisses and love and discipline. They are a joy to be around. They know that we love them and that Jesus loves them. I want you to know that this is all that matters to me. I want you to know that it’s not ok to judge me for my choice. You have to do what works for your family and I will do what works for mine. I don’t judge you for your choice. I’m joyful for you that you are able to make it. Just please let me make mine.